I believe you meant to say "Info coming soon" as none has been given yet. Naw. he posted a photo, that's information! As we can see it's in/on a wall and seems to display a book. Yes, and we also know that it wasn't snowing at the time of the picture. I retract my previous statement. 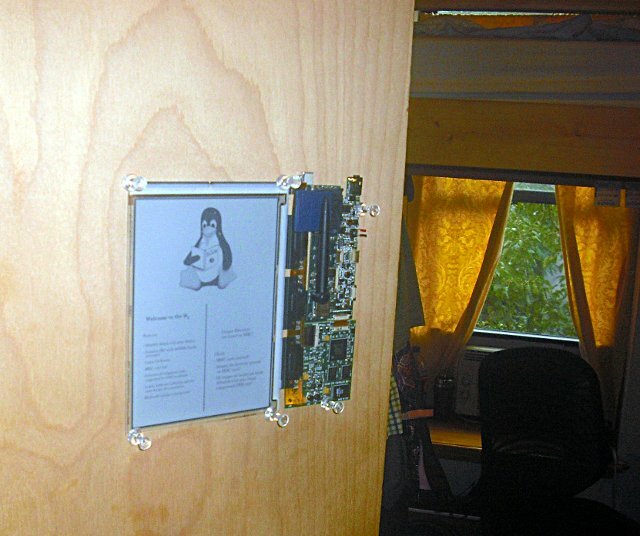 Close, it's on my door, it's displaying an intro screen, but it also runs Linux! I just fetched a power supply for it, so I'm going to power it up and try to figure out a way to get a console on it. I'm curious on how those fancy screens work. I mean, are they Serial of Parallel screens, and what medium changes with electric current to display images? I think they are super useful though. SUPER low power, but crippled by their monochrome nature. Oh, and they are also really easy to read. Anyway, can't wait to see what you do with it, or even just learn what you want to do with it besides run Linux. Well, since it runs Linux, I'm planning on syncing it with various pieces of my electronic empire to display info about emails waiting for me, posts on Cemetech waiting, hopefully my location on a map if I can get my eeePC's GPS to be more reliable, and my schedule for the day. It would be cool to make it do a small slideshow of random pictures from my photo albums too. My current roadblock is trying to figure out what the hell voltage electricity it wants; I have to wait until Tuesday to get access to a variable-voltage supply to find out. So they're massively parallel: the driver circuit has to deal with multiplexing 800 rows and 600 columns, then scans through the (800*600=) 480,000 "pixels" one by one, setting it to white or black or gray. Basically, each pixel is a tiny, tiny ball, divided up into four quarters, one each of white, gray, dark gray, and black. Underneath each ball is an element to attract or repel one side of the ball; by varying the voltage, you can control which side of the ball goes upwards. The downside is that they are very slow (~1s) to clear and refresh, but once they're set, they take zero power to maintain; each ball just stays as it was. You only need power again when you want to change the image. So it's kinda like a palm pilot? Just a little something that can show you what's happening in the digial world. I am glad to know that it is parallel. Harder to interface, but can do more in the long run. Thanks for explaining exactly how the screen works. I've been curious since about June in this summer on what I could do with an e-reader. I'm disappointed to know it takes a whole second to refresh. No animation huh! Most computer monitors are 60 Hz. Compared to this, that's lightning fast. 60 TIMES SLOWER than a LCD. Super awesome that it takes 0 power to hold an image. That's why its so low power! Indeed, except mounted to my door. It's parallel in the sense that each row and column is a parallel data line, but it's not parallel in the sense of a DB-25 connector is parallel; there's a very complex graphics driver that's used to interface it, which luckily I don't have to deal with because it's already written. 60 times slower indeed, but much much easier on the eyes, since it's more like real paper than an LCD. And yup, that's why it's so low-power. ...it's more like real paper than an LCD. And yup, that's why it's so low-power. Which is what I find amazing. Maybe, they have a "multi" colored ball that only focuses the very tip top point on the sphere. Just an idea, though. *bump* So it turns out that for some annoyingly proprietary reason, the e-paper works at 8.9V, about 8.8V through 9.0V, but nothing below 8.8V or above 9.0V. Therefore, I whipped out a 12V Linksys wallwart that outputs 17.1V unloaded, built a little voltage regulator with an LM317, and hooked it up. Success! After a few minutes, though, the regulator gets uncomfortably hot. Do I heatsink the LM317, do I try to go for a higher-current regulator, do I do something else? Dunno. Switching regulators are generally the way to go, but they are a little more complicated to use than a linear regulator. For the time being I'd probably go for a heatsink. As another temporary measure, you could try putting a few moderately chunky rectifier diodes between the unregulated PSU and the voltage regulator. Keeping the input voltage as close to the output voltage plus the dropout voltage reduces the amount of power that a linear regulator has to waste as heat. (Edit: Of course, that power is still wasted, but is wasted through a bunch of diodes as well as through the regulator). Hmm, looks like an LM2577 would do the trick for a switching regulator; I'd just need to find myself something like a 100uH inductor to go with it. I'll try the diode + heatsink plan and see what kind of temperatures I get on the components. Wow! That's pricey. For what you get, I think I'll wait until the screens are more readily available to experiment. I wonder where all the e-reader companies get theirs for so cheap? They're often both the manufacturer of the screen and the device, or else they have a super-bulk contract. These are artificially overpriced so that normal hobbyists can't just pick them up; they're aimed more at R&D labs of companies, where $3K is nothing. If they keep hobbist/hacker out, their technology will never improve, now will it? Well, for a budding technology like this, the vast majority of hardware hackers don't generally have advanced equipment or expertise necessary to make nifty stuff with these, whereas corporations generally do, unfortunately. © Copyright 2000-2019 Cemetech & Christopher Mitchell :: Page Execution Time: 0.248703 seconds.